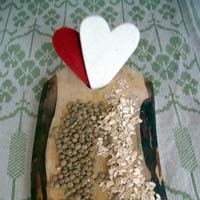 Peas, like the other pulses and grains of Scandinavia are great heart food! If you’re feeling a little overloaded after all of the festivities, you’ll want to take it a little easy on the food front. However, latest research supports what we have always known: crash dieting isn’t the answer! Particularly during this sneezy time of year, you expose yourself to flu by reducing your intake of nutritious foods. What you need at this time of year is pea soup. Sounds terrible, but if you make it from scratch, it is everything but terrible. Garnished with a few slivers of left-over smoked salmon or (dare we say it) that Christmas ham, it is a true January delight that will be your guardian against nasty colds. While pea soup seems like it takes a long time to prepare, the reality is that the actual time spent working in the kitchen is very short. You just need to plan a bit for soaking overnight and allowing the soup to cook. Here’s how with a few modifications to the traditional recipe. Rinse the peas and allow them to soak in water overnight. If the peas look dry in the morning, add a little more water so that there is something to cook them in (the peas should still be covered in water). Remove any of the husks that have floated up to the top of the water. Saute chopped onion in olive oil in a cooking pot. Add cloves, chopped marjoram and 2 cloves crushed garlic and continue to saute for another minute. Pour in the soaked beans and water, and add stock cubes. Stir. Allow the soup to simmer, reduce to low heat and cover. Allow peas to cook for approximately two hours. Check after an hour to make sure that the peas are not sticking to the bottom of the cooking pan. If so, add a bit of water. Once the peas are soft, add a pinch of sugar, salt and pepper to taste. Garnish with extra marjoram and slivers of smoked salmon or ham. Serve with wholemeal bread.